Ground floor: Open plan sitting/dining room/ kitchen (dishwasher, oven, microwave, washing machine, TV, DVD, WiFi, fireplace) with patio doors to covered terrace. Double bedroom with en suite shower room and patio doors to private balcony. Shower room. Twin bedroom. Heating and air conditioning throughout the house. Outside: Covered and open terraces. Poolside shower. In-built barbecue*. Private parking. Private swimming pool (7.5 m x 4.5m, uniform depth of 1.2m) with corner Roman steps. Combining stunning panoramic rural vistas with a modern and stylish interior, El Tajaral is a unique property in a fabulous location perfect for couples and small groups. Looking out towards the quintessential ‘pueblo blanco’ of El Gastor, the zen-like décor of this comfortable home encourages rest and relaxation whilst also making a great base from which to explore the very best of what this fascinating area of Andalucía has to offer. Inside, a contemporary kitchen, dining area and lounge create an elegant open plan living space. Either side of the fireplace, large windows offer spectacular views that stretch out across the Sierra de Cádiz towards Olvera. A small hallway next to the main living space leads to a twin bedroom and shower room while the master double enjoys en suite facilities and its own private balcony, surely the perfect place to take your morning coffee whilst contemplating those impressive picture postcard views of the rolling Andalucían countryside. From the lounge area, patio doors lead out onto a spacious terrace complete with a covered dining area and private swimming pool. It is from here that you can fully appreciate the majestic backdrop provided by the local mountains of El Algarín and Las Grajas. If you can bear to leave the idyllic surroundings of El Tajaral, a 5 minute drive will take you to the centre of El Gastor where you will find all amenities and some typical restaurants serving traditional local cuisine. A drive of just 35 minutes will take you to Ronda, one of the most charming and spectacular cities in all of Spain. Terraced grounds mean that young children may need some supervision. Internet provision is via a satellite connection. If you like to walk, then this is the area for you. The Grazalema natural park is just a short drive away but there are some attractive walks to do in nearby El Gastor too. 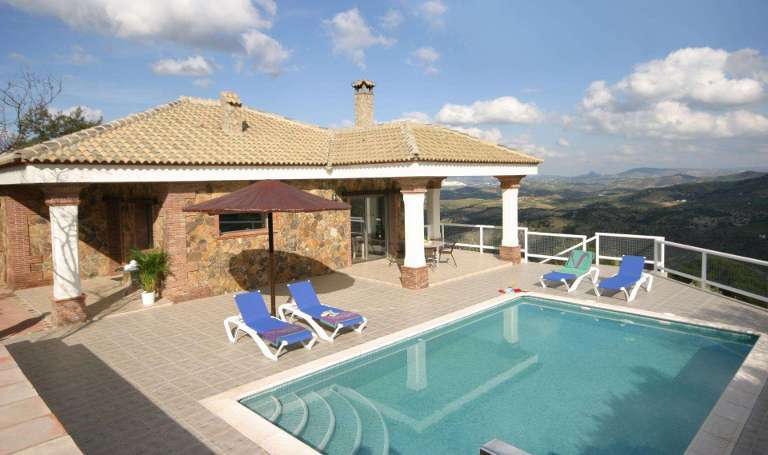 The two peaks seen from the villa can be reached on foot and the views are incredible! As you sip your morning coffee and enjoy the views to Olvera in the distance you are bound to want to go and explore it. Olvera is a pretty, unspoilt white hillside town with a castle and large church towering above the houses. The nearby city of Jerez is home to a whole host of sherry companies. Many of the bodegas offer daily tours, such as Tio Pepe. After the tour, there'll be the opportunity to relax at the long tables and sample all of the different Sherry varieties. Combine your day out with a visit to the city centre or the famous Ecuestrian Horse Show. There is plenty to see and do in this vibrant, colourful city. Make life easier by driving to the outskirts and catching the metro in the centre, there is free parking. The Cathedral, Giralda Tower, Real Alcazar Palace and the Plaza España are just a few of the interesting places to see. Take a bus or river boat tour, hire a bicycle or horse and carriage or simply explore on foot, there are many ways to take in the sights. The view from the terrace area of El Tajaral is delightful with the peaks of El Algarín and Las Grajas set before you. Bird watchers will not be disappointed, there are large groups of Griffon Vultures to be seen all day long. El Gastor is a friendly village and life rotates around the small square where you can sit at a local cafe and watch the world go by. No one is in a hurry here, you'll soon find you relax into the slower pace of life! A picturesque nearby village is Zahara de La Sierra. It's a steep walk up to the medieval castle perched high above the rooftops - but well worth the effort for the fabulous views over the lake, the terracota roof tiles below and the mountains far beyond. Zahara is a small, but lively mountain village with a welcoming square to sit and have a drink to cool off! The historic town of Ronda is a short drive away and is one of the most beautiful towns in all of Spain. Its impressive gorge and famous bridge are not to be missed. A stroll through the old town feels like you have turned the clock back in time. The third most visited place in Andalucia, Ronda has something for everyone. With a refreshing pool to enjoy, you'll find it difficult to tear yourself away! The terrace is quite a sun trap, so sip a drink, have a snooze or just marvel at the stunning views! Dotted around the mountains are many wonderful white washed villages to explore. A firm favourite with many guests is Grazalema, nestled in the heart of the National Park, the Sierra de Grazalema. Just the wonderful drive there is worth it! It has an excellent choice of cafes and restaurants. You can easily spend the afternoon browsing the array of gift shops selling local produce such as hand woven wool shawls and blankets, pottery, cheese, cakes, wine and leather goods. Close by is the lake of El Gastor - Zahara. You can hire kayaks and explore the waters. In the hotter summer months there is also La Playita, a lagoon of fresh spring waters with grassed areas and trees for shade, life guards and bar. The Spanish love a party! and they know how to do it well! The first weekend in August sees the Feria in El Gastor and there is plenty of socialising, flamenco singing, dancing, horses, bulls and fun and games to enjoy. During the first week in October locals pay homage to their Patron Saint the Virgen del Rosario. There are colourful processions, a super atmosphere and it's a chance to see the true Andalusian spirit.